“For fourteen years (1860 to 1875) Madame Blavatsky was an avowed Spiritualist, controlled by a spirit called ‘John King’ . . . She attended many séances, &c.”With the exception that I attended many séances,–– but this would hardly prove any one to be a Spiritualist—all these assertions are entirely false. I say the word and underline it, for the facts in them are distorted, and made to fit a preconceived and very erroneous notion, started first by the Spiritualists, whose interest it is to advocate “spirits” pure and simple, and to kill—if they can, which is rather doubtful—belief in the wisdom, if not in the very existence, of our revered masters. by, it is I who control the so-called spirits, he is yet made to say by Mr. Lillie, who refers the public to Colonel Olcott’s book, that it is I who was controlled! Is this a misstatement and a misquotation, I ask, or is it not? Again, it is stated by Mr. Lillie that I conversed with this “spirit” (John King) during fourteen years, “constantly, in India and elsewhere.” To begin with, I here assert that I had never heard the name of “John King” before 1873. True it is, I had told Colonel Olcott and many others that the form of a man, with a dark pale face, black beard, and white flowing garments and fettah, that some of them had met about the house and my rooms, was that of a “John King.” I had given him that name for reasons that will be fully explained very soon, and I laughed heartily at the easy way the astral body of a living man could be mistaken for, and accepted as, a spirit. And I had told them that I had known that “John King” since 1860; for it was the form of an Eastern adept, who has since gone for his final initiation, passing through and visiting us in his living body on his way, at Bombay. Whether Messrs. Lillie and Co. believe the statement or not, I care very little, as Colonel Olcott and other friends know it now to be the true one. I have known and conversed with many a “John King” in my life—a generic name for more than one spook—but thank heaven, I was never yet “controlled” by one! My mediumship has been crushed out of me a quarter of a century or more; and I defy loudly all the “spirits” of the Kama-loka to approach—let alone to control me now. Surely it is Mr. Arthur Lillie who must be “controlled” by someone to make untruthful statements, which can be so easily refuted as this one. to cross-examine me? But since he chooses to take such liberties with my name, I will tell him plainly that he himself knows nothing, not only of initiations and Tibet, but even of exoteric—let alone esoteric—Buddhism. What he pretends to know about Lamaism he has picked up from the hazy information of travellers, who, having forced themselves into the borderland of Tibet, pretend on that account to know all that is within the country closed for centuries to the average traveller. Even Csoma de Körös knew very little of the real gelukpas and Esoteric Lamaism, except what he was permitted to know; for he never went beyond Zanskar, and the lamasery of Phag-dal—erroneously spelt by those who pretend to know all about Tibet, Pugdal, which is incorrect, just because there are no meaningless names in Tibet, as Mr. Lillie has been taught to say. And I will tell him also that I have lived at different periods in Little Tibet as in Great Tibet, and that these combined periods form more than seven years. Yet, I have never stated either verbally or over my signature that I had passed seven consecutive years in a convent. What I have said, and repeat now, is, that I have stopped in Lamaistic convents; that I have visited Tzi-gadze, the Tashi-Lhünpo territory and its neighbourhood, and that I have been further in, and in such places of Tibet as have never been visited by any other European, and that he can ever hope to visit. left the train half way, was met by friends with a conveyance, and passed with them into the territory of Sikkim, where I found my Master and Mahatma Koot Hoomi. Thence five miles across the old borderland of Tibet. no Mahatma Koot Hoomi at all, the idea alone is absurd. He will have to dispose, before he does anything more, of a certain lady in Russia, whose truthfulness and impartiality no one who knows her would ever presume to question, who received a letter from that Master so far back as 1870. * Perchance, a forgery, also? As to my having been in Tibet, at Mahatma Koot Hoomi’s house, I have better proof in store––when I believe it needed—than Mr. Lillie’s rancorous ingenuity will ever be able to make away with. If the teachings of Mr. Sinnett’s Esoteric Buddhism are considered atheistic, then I am an atheist too. And yet, I would not deny what I wrote in Isis as quoted by Mr. 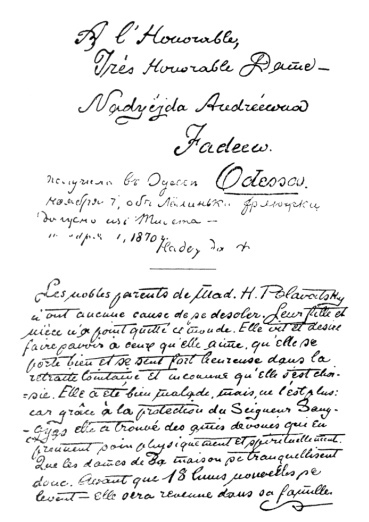 This passage, translated from the original French letter, can be found in the Report of the Result of an Investigation into the Charges against Madame Blavatsky, p. 94, a Document published in 1885 by the General Council of The Theosophical Society, at Adyar. 15 cm. x 121/2 cm., and the writing of both envelope and slip appears to be in ink. “Les nobles parents de Mad. H. Blavatsky n’ont aucune cause de se désoler. Leur fille et nièce n’a point quitté ce monde. Elle vit et désire faire savoir à ceux qu’elle aime, qu’elle se porte bien et se sent fort heureuse dans la retraite lointaine et inconnue qu’elle s’est choisie. Elle a été bien malade, mais, ne l’est plus: car grâce à la protection du Seigneur Sang-gyas elle a trouvé des amis dévoués qui en prennent soin physiquement et spirituellement. Que les dames de sa maison se tranquillisent donc. Avant que 18 lunes nouvelles se lèvent—elle sera revenue dans sa famille. “The noble relatives of Mad. H. Blavatsky have no cause whatsoever for grief. Their daughter and niece has not left this world at all. She is living and desires to make known to those whom she loves that she is well and feels very happy in the distant and unknown retreat she has selected for herself. She has been very ill, but is so no longer; for owing to the protection of the Lord Sanggyas she has found devoted friends who take care of her physically and spiritually. Let the ladies of her house, therefore, remain calm. Before 18 new moons shall have risen––she will have returned to her family. Row’s” solitary head then in dozens of heads of “Orientalists” about London, we know of. The same with regard to the Master’s name. If Mr. Lillie tells us that “Koot Hoomi” is not a Tibetan name, we answer that we never claimed it to be one. Every one knows that the Master is a Puñjabi whose family was settled for years in Kashmir. But if he tells us that an “expert at the British Museum ransacked the Tibetan dictionary” for the words “Koot” and “Hoomi,” and found no such words, then I say, “buy a better dictionary” or “replace the expert by a more expert one.” Let Mr. Lillie try the glossaries of the Moravian Brothers, and their alphabets. I am afraid he is ruining terribly his reputation as an Orientalist. Indeed, before this controversy is settled, he may leave in it the last shreds of his supposed Oriental learning. following: “Received at Odessa November 7, about Lelin’ka....probably from Tibet—November 11, 1870. Nadyezhda F.” The blank in the above indicates an undecipherable word; Lelin’ka is the Russian diminutive of Yelena (Russian equivalent for Helen). The gaps which are evident in Miss de Fadeyeff’s handwriting are due to the fact that the envelope has been partly eaten by the destructive insects common to tropical countries, as is explained! by C. Jinarâjadâsa. Lord Sang-gyas (also Sang-gyäs) is the Tibetan title for the Lord Buddha. there, or found myself there by accident, are questions that pertain to my private life, with which, it appears to me, Mr. Lillie has no concern. But this is on a par with his, other ways of dealing with his opponents. General Kanzler. The French had 3,000 under General Failly, with excellent artillery. Garibaldi was wounded and taken prisoner during the retreat. He lost some 600 men. In 1877 a monument was erected on the battlefield in memory of the Garibaldian dead. collect every vile rumour and idle gossip about me, its editor, and allying himself with some of our enemies he sailed out with his very weak pamphlet, in which he unveiled really no one but himself. Why does he not show, to begin with, that his reviewer was wrong? Why does he not, by contradicting our statements, firmly establish his own authority as an Orientalist; showing, first of all, that he is a genuine scholar, who knows the subject he is talking about, before he allows himself to deny and contradict other people’s statements in matters which he knows still less about? He does nothing of the kind, however; not a word, not a mention of the scourging criticism that he is unable to refute. Instead of that, we find the offended author trying to throw ridicule on his reviewers, so as to lessen probably the value of what they have to say of his own book. This is a clever, very clever strategy. Whether it is an honourable one remains, withal, an open question. if this volume in turn were examined with the care almost undeservedly devoted to the first, and if it were referred to the authority of such real Oriental scholars and Sanskritists as Mr. R. T. H. Griffith, for instance, I think it would be found that the aggregate blundering of the two books put together might excite even as much amusement as the singular complacency with which the author betrays himself to the public.